The thrills, spills and lucky escapes of the 4th Fighter Group during World War II! From the days of clandestine training in Canada and early days as the legendary Eagle Squadron to dog-fights over Europe and final victory. Adventures of the 4th Fighter Group is over 330 pages long, measures 6"x9" with 192 images and is packed with tales of daring and excitement! Combining the personal recollections of veteran pilots then and now, and thoroughly researched true tales full of rich and evocative detail, author/artist Troy White covers new ground with his latest book about the adventures of the keen young pilots of the Fourth Fighter Group. Found among the tales are those of 4th luminaries including Don Gentile, Ralph “Kidd” Hofer, Jim Goodson along with the stories of Red Patterson, Sy Koenig, Gilbert Hunt and Otey Glass - just to name a few. 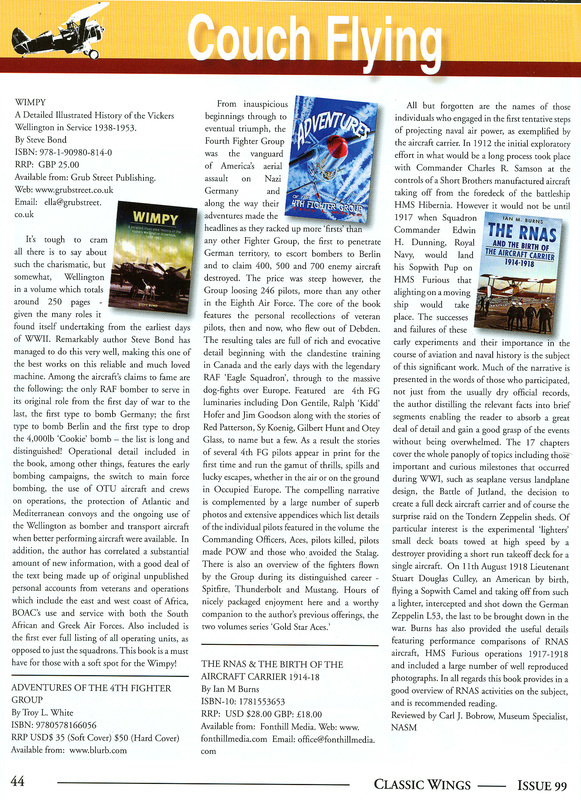 The stories of several 4th FG pilots appear in print for the first time. The book is available in colour or black & white, hard cover or soft cover.